The American statesman Daniel Webster was born in Salisbury (now Franklin), New Hampshire, on the 18th of January 1782. He was a descendant of Thomas Webster, of Scottish ancestry, who settled in New Hampshire about 1636. His father, Ebenezer Webster (1739-1806), was a sturdy frontiersman; when, in 1763, he built his log cabin in the town of Salisbury there was no habitation between him and Canada. He was a member of Rogers' Rangers in the Seven Years' War, served in the War of Independence, was for several years a member of the New Hampshire legislature, was a delegate to the New Hampshire convention which ratified the Federal constitution, and was a justice of the court of common pleas for his county. Daniel was a frail but clever child, and his family made great sacrifices to give him and his elder brother Ezekiel a good education. He attended Phillips Exeter Academy for about nine months in 1794, was further prepared for college by Dr. Samuel Wood, the minister at Boscawen, and graduated at Dartmouth College in 1801. He was chosen Fourth of July orator in Hanover, the college town, in 1800, and in his speech appears the substance of the political principles for the development of which he is chiefly famous. After graduation he began the study of law in his native town. When in the following winter money had to be earned to enable Ezekiel to remain in college, Daniel accepted the principalship of the academy at Fryeburg, Maine; but he resumed his law studies in the following year, and in 1804, with Ezekiel's assistance, he was enabled to go to Boston and conclude his studies under Christopher Gore (1758-1827), later governor of Massachusetts (1809-10) and a U.S. Senator (1813-16). Admitted to the bar in Boston in 1805, Webster began the practice of law at Boscawen, but his father died a year later, and Webster removed in the autumn of 1807 to Portsmouth, then one of the leading commercial cities of New England. Here he rose rapidly to eminence both at the bar and in politics. His political career began in earnest at the opening of the War of 1812. He led the opposition in his state to the policy of James Madison's administration, was elected by the Federalists a member of the National House of Representatives, and took his seat in May 1813. Henry Clay, the speaker, appointed him a member of the Committee on Foreign Relations, of which John C. Calhoun was chairman, and for some forty years these three constituted a great triumvirate in American politics. Webster had been in the House less than three weeks when he greatly embarrassed the administration by introducing a set of resolutions asking for information relating to the immediate cause of the war. In January 1814, when a bill to encourage enlistments was before the House, he attacked the conduct of the war in his first great speech. An even more forcible speech, delivered later in the same session, in support of a bill for repealing the embargo and non-importation acts, marked him as one of the foremost men in Congress. He successfully opposed a bill providing for what would have been practically an irredeemable currency, and he voted against the bill for chartering the second United States bank, although it provided for the redemption of bank notes in specie, because he objected to permitting the government to have so large a share in its management. Webster removed to Boston in June 1816. This cost him his seat in Congress after the 4th of March 1817, and for the next six years he was engaged chiefly in the practice of law in the courts of Massachusetts and before the U.S. Supreme Court. His first leading case before the Supreme Court was the Dartmouth College Case. In 1815, when the Dartmouth board of trustees was rent by factions, the majority, who were Federalists and Congregationalists, removed the president, John Wheelock, who was a Presbyterian, and appointed Francis Brown in his place. Wheelock appealed to the legislature in the following year, when it was strongly Republican, and that body responded by passing acts which virtually repealed the charter received from King George III, created a state university, placed Wheelock at its head, and transferred to it the property of the college. The case came before the Supreme Court of New Hampshire in May 1817. Jeremiah Mason (1768-1848), a lawyer of the first rank, Jeremiah Smith and Webster appeared for the college, and argued that these acts were invalid because they were not within the general scope of the legislature's power, because they violated provisions of the state constitution and because they violated the clause of the Federal Constitution which prohibits a state from impairing the obligation of contracts but the court decided against them. On the last point, however, the case was carried to the Supreme Court of the United States, and there Webster, presenting principally arguments of his colleagues at the state trial and making a powerful appeal to the emotions of the court, won the case for the college and for himself the front rank at the American bar. The result, too, vindicating as it did the supremacy of the Constitution of the United States, was a substantial gain for that nationalism which Webster advocated in his first Fourth of July oration at Hanover, and the promotion of which was for the remainder of his career his principal service to his country. His next great case was that of McCulloch v. Maryland. Maryland had imposed a tax upon the Baltimore branch of the Bank of the United States. The Maryland Court of Appeals sustained the validity of this act. Webster, supported by William Pinkney and William Wirt, argued in February 1819, (1) that the power to establish a bank was to be implied from the general power given to Congress to administer the financial affairs of the nation, and was a means of administering the finances which was appropriate and within the discretion of Congress; (2) that "the power to tax is the power to destroy", and that a state had not the constitutional power to impose a tax upon any instrumentality of the government of the United States. The Supreme Court sustained these arguments and the act of Maryland was held to be void. Four years later (1823) Webster argued the case of Gibbons v. Ogden. The state of New York, in order to reward the enterprise of Robert R. Livingston and the inventive genius of Robert Fulton in the application of the steam engine to traffic on the water, had given to them a monopoly of all transportation by steam within the waters of New York. The highest court of that state sustained the validity of the monopoly. Gibbons, who had begun to run a steamboat from New Jersey, appealed to the Supreme Court. Webster argued that the Federal Constitution gave to Congress control over interstate commerce, and that any interference by the legislature of a state with this commerce was unconstitutional and void. The Supreme Court so held; its opinion, written by Chief Justice John Marshall, being little else than a recital of Webster's argument. In the case of Ogden v. Saunders, heard in 1824 and reheard in 1827, in which the question was the validity or invalidity of the insolvent laws of the several states, Webster argued that the clause prohibiting a state from impairing the obligation of contracts applied to future as well as to past contracts, but the court decided against him. "Not many days ago I saw at breakfast the notablest of your notabilities, Daniel Webster. He is a magnificent specimen. You might say to all the world, 'This is our Yankee Englishman; such limbs we make in Yankee land!' As a logic fencer, or parliamentary Hercules, one would be inclined to back him at first sight against all the extant world. The tanned complexion, that amorphous crag-like face; the dull black eyes under the precipice of brows, like dull anthracite furnaces, needing only to be blown; the mastiff mouth accurately closed; I have not traced so much of silent Berserkir rage that I remember in any man." In 1820 Webster took an important part in the convention called to revise the constitution of Massachusetts, his arguments in favor of removing the religious test, in favour of retaining property representation in the Senate, and in favor of increasing the independence of the judiciary, being especially notable. He was a member of the National House of Representatives from 1823 to 1827 and of the Senate from 1827 to 1841. Soon after returning to the House he supported in a notable speech a resolution to send a commissioner to Greece, then in insurrection. The tariff was to him a distasteful subject, and he was governed in his attitude toward it largely by the wishes of the majority of his constituents. He opposed the tariff bill of 1816 and in 1824, and he repudiated the name of "American system", claimed by Clay for his system of protection. When, however, the tariff bill of 1828, which was still more protective, came up for discussion, Webster had ceased to oppose protection; but he did not attempt to argue in favor of it. He stated that his people, after giving warning in 1824 that they would consider protection the policy of the Government, had gone into protected manufactures, and he now asked that that policy be not reversed to the injury of his constituents. In later speeches, too, he defended protection rather as a policy under which industries had been called into being than as advisable if the stage had been clear for the adoption of a new policy. The tariff of 1828 aroused bitter opposition in South Carolina, and called from Vice President Calhoun the statement of the doctrine of nullification which was adopted by the South Carolina legislature at the close of the year and is known as the South Carolina Exposition. Senator Robert Y. Hayne, from the same state, voiced this doctrine in the Senate, and Webster's reply was his most powerful exposition of the national conception of the Union. The occasion of this famous Webster-Hayne debate was the introduction by Senator Samuel A. Foote (1780-1846) of Connecticut of a resolution of inquiry into the expediency of restricting the sales of the Western lands. This was on the 29th of December 1829, and after Senator Thomas Hart Benton of Missouri had denounced the resolution as one inspired by hatred of the East for the West, Hayne, on the 19th of January 1830, made a vigorous attack on New England, and declared his opposition to a permanent revenue from the public lands or any other source on the ground that it would promote corruption and the consolidation of the government and "be fatal to the sovereignty and independence of the states." Webster's brief reply drew from Hayne a second speech, in which he entered into a full exposition of the doctrine of nullification, and the important part of Webster's second reply to Hayne on the 26th and 27th of January is a masterly exposition of the Constitution as in his opinion it had come to be after a development of more than forty years. He showed the revolutionary and unpractical character of any doctrine such as nullification based on the assumption that the general government was the agent of the state legislatures. It placed the general government, he said, in the absurd position of a "servant of four-and-twenty masters, of different wills and different purposes, and yet bound to obey all." He then argued at length that the correct assumption was that both the general government and the state government were "all agents of the same supreme power, the people", that the people had established the Constitution of the United States and that in the Supreme Court, established under that Constitution, was vested the final decision on all constitutional questions. Whatever may be said of the original creation of the Constitution, whether by the states or by the people, its development under the influences of a growing nationalism was a strong support to Webster's argument, and no other speech so strengthened Union sentiment throughout the North; its keynote was "Liberty and Union, now and forever, one and inseparable." South Carolina, however, insisted that its doctrine was sound, and in November 1832 passed an ordinance declaring the revenue laws of the United States null and void. President Andrew Jackson responded with a proclamation denying the right of nullification, and asked Congress for authority to collect the revenue in South Carolina by force if necessary. A bill, known as the Force Bill, was introduced in the Senate, and in the debate upon it Webster had an encounter with Calhoun. His reply to Calhoun, printed as "The Constitution not a compact between sovereign States", is one of his closest legal arguments, but somewhat overmatched by the keen logic of his adversary. Webster's support of President Jackson in the South Carolina trouble helped to drive Calhoun into an alliance with Clay; and Clay, whose plan of preserving the Union was by compromise, came forward with a bill for greatly reducing the tariff. Webster, strongly opposed to yielding in this way, made a vigorous speech against the bill, but it passed and South Carolina claimed a victory. In the same year (1833) the Whig party began to take definite form under the leadership of Clay, in opposition, chiefly, to President Jackson's bank policy, and Webster joined the ranks behind Clay with an aspiration for the presidency. He was formally nominated for that office by the Massachusetts legislature in 1835, and received the electoral vote of that state, but of that state only. Four years later his party passed him by for William Henry Harrison, the hero of Tippecanoe, and Webster refused the proffered nomination for Vice President. President Harrison appointed Webster secretary of state but died one month after taking office. John Tyler, who succeeded to the presidency, was soon "read out of his party", and all his cabinet except Webster resigned. Webster hesitated, but after consultation with a delegation of Massachusetts Whigs decided to remain. Although he was severely criticized there were good reasons for his decision. When he entered office the relations between the United States and Great Britain were critical. The McLeod case in which the state of New York insisted on trying a British subject, with whose trial the Federal government had no power to interfere, while the British government had declared that it would consider conviction and execution a casus belli; the exercise of the hateful right of search by British vessels on the coast of Africa; the Maine boundary, as to which the action of a state might at any time bring the Federal government into armed collision with Great Britain -- all these at once met the new secretary, and he felt that he had no right to abandon his work for party reasons. With the special commissioner from Great Britain, Lord Ashburton, he concluded the treaty of 1842 known as the Webster-Ashburton Treaty. Differences arising out of the McLeod case were adjusted by extending the principle of extradition. The question of the suppression of the African slave trade, with which was connected the right of search, was settled by an agreement that each nation should keep in service off the coast of Africa a squadron carrying not fewer than eighty guns, and that the two squadrons should act in concert when necessary. The North-east boundary dispute was settled by a compromise which allowed Maine about 5500 square miles less than she had claimed, and allowed Great Britain about as much less on her claim, and by an agreement on the part of the government of the United States to pay to Maine and Massachusetts "in equal moieties" the sum of $300,000 for their assent. Immediately after the treaty had been concluded the Whigs insisted that Webster should leave the cabinet. He refused, for a time, to be driven, but because of their continued attacks, together with his ambition to become president, and because Tyler favored the annexation of Texas while he was opposed to it, he resigned in May 1843. He was forgiven by his party in the following year, but not until the opposition, provoked by the retention of his position under Tyler, had ruined whatever chance he might have had in that year of receiving the presidential nomination. In June 1843, on the occasion of the completion of the Bunker Hill monument, Webster delivered another classic oration. In February 1844 he argued the Girard Will Case before the United States Supreme Court. Stephen Girard had devised and bequeathed the residue of his estate for the establishment and maintenance of Girard College, in which no minister of the Gospel of any sect or denomination whatever should be admitted. The suit was brought to break the will, and Webster, for the plaintiffs, after stating that the devise could only stand on condition that it was a charity, argued that it was not a charity because no teaching was such except Christian teaching. He made an eloquent plea for Christianity, but his case was weak in law, and the court sustained the will. 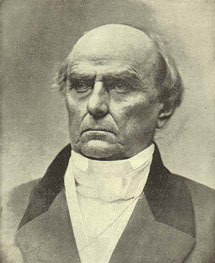 Webster was returned to the Senate in 1845. He opposed the annexation of Texas and the Mexican War, and was, as before, the recognized spokesman of his party. At the beginning of the quarrel of the North and the South over the organization of the territory acquired from Mexico, Calhoun contended that the Constitution of the United States extended over this territory and carried slavery with it, but Webster denied this on the ground that the territory was the property of, not part of, the United States, and Webster's view prevailed. The whole matter had, therefore, to be adjusted by Congress, and as the growing intensity of the quarrel revealed the depth of the chasm between the sections, Clay came forward with the famous compromise of 1850, and Webster's last great speech -- "The Constitution and the Union", or as it is more commonly known "The Seventh of March Speech" -- was in support of this Compromise. It was a noble effort to secure a lasting settlement of the slavery question, but he was bitterly denounced throughout the north as a renegade. In July 1850 Webster again became secretary of state, in the cabinet of President Millard Fillmore. Perhaps the most important act of his second term was obtaining the release of Kossuth and other Hungarian refugees who had fled to Turkey, and whose surrender had been demanded by the Austrian government. He died at his home in Marshfield, Massachusetts, on the 24th of October 1852. Webster was twice married -- first in 1808 to Grace, daughter of Rev. Elijah Fletcher, a New Hampshire clergyman. She died in 1828, leaving two sons, Daniel Fletcher, killed in the second battle of Bull Run, and Edward, a major in the United States army, who died while serving in the Mexican War, and a daughter Julia, who married Samuel Appleton. Webster's second wife was Caroline Le Roy, daughter of Jacob Le Roy, a New York merchant. He was married to her in 1829 and she survived him. The universal expression of respect and admiration at the time of Webster's death showed that he had retained the confidence of his people. Never, since the death of George Washington, had there been in the United States such a universal expression of public sorrow and bereavement. It is not too much to say that the conviction of the justice of their cause that carried the northern states successfully through the Civil War was largely due to the arguments of Webster. He had convinced the majority of the people that the government created by the Constitution was not a league or confederacy, but a Union, and had all the powers necessary to its maintenance and preservation. He had convinced the Supreme Court, and established the principle in American jurisprudence, that whenever a power is granted by a Constitution, everything that is fairly and reasonably involved in the exercise of that power is granted also. He established the freedom of the instrumentalities of the national government from adverse legislation by the states; freedom of commerce between the different states; the right of Congress to regulate the entire passenger traffic through and from the United States, and the sacredness of public franchises from legislative assault. The establishment of these principles was essential to the integrity and permanence of the American Union. Variously: Democrat, Federalist, National Republican, Whig.